I don’t regularly reserve this space for straight up farming posts very often any more, but, this! 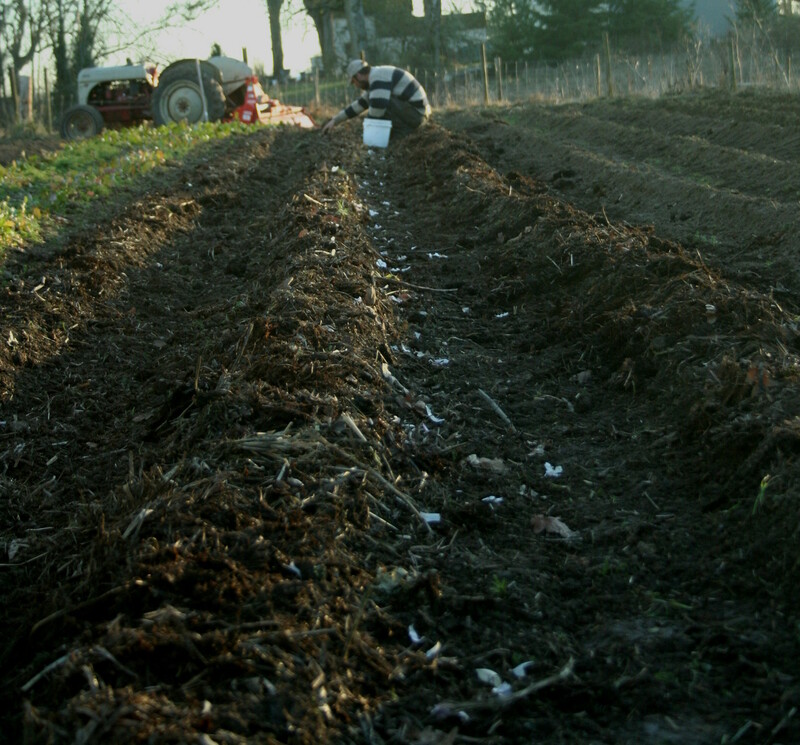 When the weather turns warm and sunny and unseasonably dry in January, dry enough to plant a little patch of ground, to smell decomposing earth, to softly crumble in your hands, then yes, farming it is. And yet this post is not just about getting a nice little peak back into the living, breathing land again, ready to grow for us some more, it is really about this constant I keep coming back to as I relish the days this week. That there is never just a give, or ever just a take. This December, we had an unseasonably cold stretch of days with near constant below freezing temperatures that turned our fields, usually winter hardy here, to mush. The more tender Asian greens, the chard, the spicy arugula, all died back to the ground. The only things left standing were the kale, ever our hero, and the collards, kale’s just as lovely cousin. Alive, yes, but with some frost damage. Alive, yes, but with only enough good leaves to harvest from gingerly. It has been, in many ways, a hungry month since then. So, when mother nature turns around and gives us extra-dry, extra-sun, and we get to make up for loss with some extra planting to cover the difference, we take it. And even though it is easy to think of this all as give, I remember the take. Even this could just as easily become that. We are certainly taking a bit of a gamble. These crops could end up not making it (though I think they will). And even though I try not to think about it, even this missing precipitation, I know, it isn’t all good, even if it is momentarily good, for us. Is there ever a moment in time that is just right? Or are they all perfectly not? 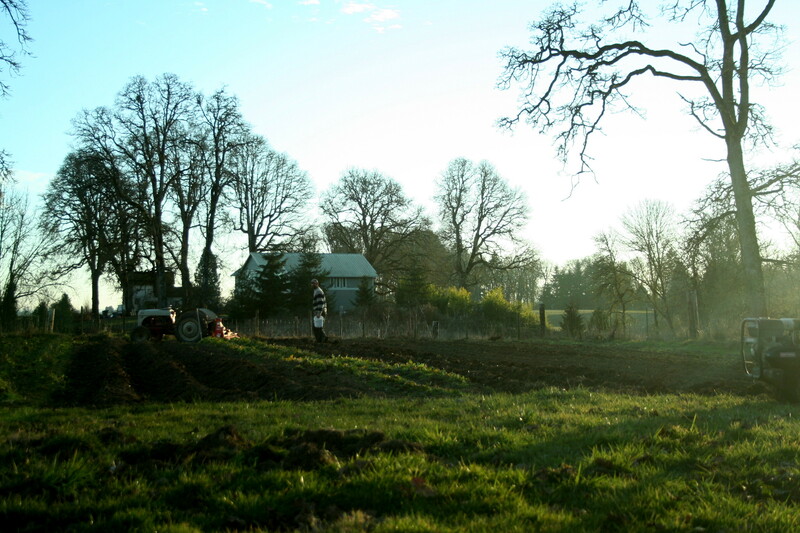 Watching my husband in the field, moving barrow full of compost with my children in tow like a hen with her chicks, the sun streaming into my heart and the worms wiggling in the baby-boy’s hand, I press the moments into my mind, snap shot, snap shot, snap shot, this is good. I think about the next moment in time, for just a second, then stop myself, because I know I’m not guaranteed it. But this one, it is mine. I recently found your blog and simply love it. This post was well written…I could almost smell the freshly-turned earth. You keep on writing, and I will keep on reading. Very well-done! i so, so love this.